Dr. Victor Montori is Professor of Medicine. Division of Endocrinology, takes place in the Knowledge and Evaluation Research Unit at Mayo Clinic. Dr. Montori is interested in how knowledge is produced, disseminated and taken up in practice — and how this leads to optimal health care delivery and patient outcomes. 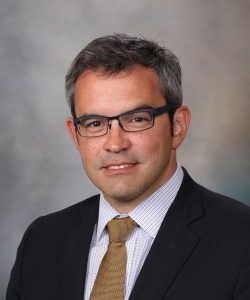 Dr. Montori also serves as director of community engagement and of late stage translational research for the Mayo Clinic Center for Clinical and Translational Science. Patients with chronic conditions are often exposed to poorly coordinated health care that pursues goals that may differ from those of the patient. As a result, their care is complex and often overwhelming, with lower quality outcomes than expected. Shared decision-making enables patients and clinicians to share the best available research evidence and make decisions that better reflect the patient’s values and preferences. Minimally disruptive medicine focuses on pursuing the patient’s goals (preventing premature death, feeling better, and living without hindrance from complications of disease or treatment) while reducing the treatment burden. Together, these approaches offer hope of patient-centered care to the most vulnerable (and expensive) patients and help better translate research evidence into practice.